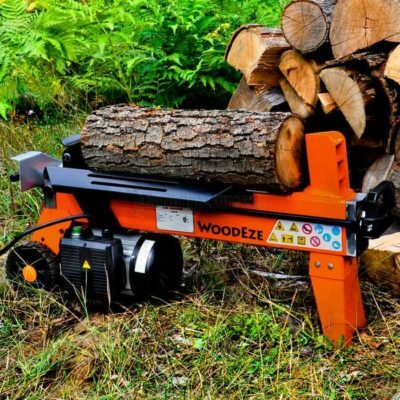 >> Log Splitters- A Complete Buyer’s Guide! There are three types of log splitters- the electric, gas and manual splitters. The kind of log splitter that you require heavily depends on a handful of factors. For example, the measure of splitting capacity that you need (which is directly dependent on the sizes of the logs being cut, the conditions in which you plan to utilize your splitter, and also the measure of work that you intend to use during the splitting process. If you are searching for a log splitter with a high splitting capacity, you would want to consider the gas log splitters. These tend to offer the highest amounts of splitting capabilities- going up to 38 tons (depending on the model you pick). An electric log splitter too can give you enough splitting power to complete the project, depending on the sizes of the logs you intend to split. Most electric log splitters deliver a range from 4-7 tons of cutting power. Manual log splitters are the least costly of the three varieties of log splitters available. They can offer you up to 10 tons of manual splitting power. Let’s take a closer look at the specific features that come with each log splitter model to help you make an informed decision. They offer the convenience of being employed indoors. You can comfortably use them in your basement garage or any outdoor building where fumes could be a problem. Since the log splitter does not run on gas, you don’t have to worry about the release of any fumes that could cause adverse health effects to you and other house occupants. Another reason you’d want to go for the electric log splitter is that most models permit you to utilize a standard 120-volt socket. This means they can safely be powered by the household current. They also come furnished with a grounding feature that keeps circuit overload from happening. One more benefit you’ll acquire from using an electric log splitter is that they have a tendency to be more moderately priced than the gas fueled log splitters and are sufficiently great at addressing all the needs of the consumer. These are the toughest log splitters available on the market today. What’s more, they deliver the most tons of splitting power than any other log splitter. Running up to 38 tons of cutting capacity, you can rest assured that these powerful machines will be ready to break even the toughest (and knottiest) of logs effortlessly. The gas fueled log splitters are highly portable. They are usually accompanied with a trailer hitch that allows you to take them with you to the field as necessary. However, most manufacturers recommend you to tow their models off the road at low speeds. The major drawback with the gas-powered splitters is that they’re the most expensive models on the market and they should be utilized with appropriate ventilation to keep off the harmful fumes they produce. Manual splitters are the cheapest of all the log splitters. They usually come in both vertical and horizontal designs. This cheaper alternative can give you up to 10 tons of splitting capacity that’s controlled by a two-speed pump. With this pump, you can easily control the speed using levers which offer you the needed amount of force when activated. The low rate is usually used to split the grain initially, while the high speed is utilized to finish the task. There is a broad range of manual log splitter models accessible today. Many of these are incredibly portable and lightweight which enables them to effortlessly be brought with on the field or an outdoors trip easily. The main drawback is that they require more manual labor work to operate, and are significantly more tedious. Just don’t attempt to use the manual log splitter if you have a huge amount of wood logs to split. Log splitters are useful machines that will save you lots of time and reduce the amount of physical energy you would require to cut wood logs effectively. Depending on your personal needs and requirements, there are three main types of log splitters namely gas, electric, and manual. As we’ve discussed in the above post, each type comes with its share of benefits and drawbacks. Take time to understand the features of each model as explained above, and you’ll be able to choose the best machine that matches your needs.